Lord Siva, with his aids and troups, while hunting wild animals in the forest reached a place called Koolikkunnu - a beautiful forest blessed with a stream and meadows. While resting at the Koolikunnu, he saw a young, beautiful forest girl - half nakedly bathing in the river. Lord Siva was stunned to see her beauty and got strong desire to possess her. He asked her name and whereabouts. Her name was Koolivaka, the daughter of the forest king. After knowing her name and details, Lord Siva expressed his interest in her, flirted her and wooed for sexual pleasure. But, Koolivaka, who is an ardent devotee of Goddess Parvathy, realized that the hunter standing in-front of her is not an ordinary man, but the Lord Paramasiva himself. In-order to escape, she told a lie to Lord Siva that she is in her periods and hence could not be touched.. She promised to satisfy his desire after 7 days,at the same place. Koolivaka, in deep feeling prayed Sree Parvathy, the wife of Lord Siva about the incident and sought her help to solve the problem. Sree Parvathy Devi apperard before Koolivaka and consoled telling her that She (Parvathy) will meet Lord Siva in disguise at the appointed place and time. Accordingly Sree Parvathy Devi met Lord Siva in disguise with the help of Lord Mahavishnu. Lord Siva enjoyed all sexual pleasures with Sree Parvathy who came in disguise of Koolivaka with the help of Mahavishnu. 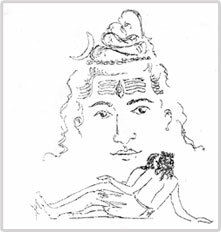 After receiving the sperms from Lord Siva, Parvathy deposited the ovule in two Cubers (Kizhangu). One cuber was deposited at the river bank and the other was gifted to Koolivaka and advised Koolivaka to eat it. Parvathy devi blessed Koolivaka saying that, she will give birth to a child, who have the strength and capabilities of Lord Siva and Parvathy, if she (Koolivaka) ate that cuber. From the cuber deposited at the river side gave birth to 300 Chathan kids. As instructed by Sree Parvathy, Koolivaka ate the cuber. On eating the Cuber (Kizhangu), Koolivaka became pregnant. When the delivery time approached, Koolivaka suffered from acute pain and feared that she will die out of pain. She prayed Lord Mahavishnu for a smooth delivary. Quickly, a child with exquisite features born in Maya of Mahavishnu. Hence this child is known as Vishnumaya. Since Vishnumaya was born to a jungle woman, he is known in his pet name Chathan. The name Kuttichathan was falled upon him, since he is small and ever young. In-order to comply the religious rituals like ‘Charadu Kettu' and naming ceremony, education Koolivaka decided to take the child to his father Lord Siva. With this mission, Koolivaka went to ‘Kailasa' – the abode of Lord Siva and Parvathy. On seeing Koolivaka with her child at Kailasa, Lord Siva got scared and instructed his aids to bring Koolivaka stealthy to him without the notice of Sree Parvathy. But Sree Parvathy Devi knows all the facts, reached at the scene, explained Lord Paramasiva what has happened. Lord Sive became happy over Parvathy Devi's revelations. Lord Siva adorned a yellow twain (Poonool) on the baby and named him Vishnumaya and blessed with all the powers to protect the weak and informed him that his name will be known in Three Worlds.He also gifted a big, strong and beautiful buffalo for his travel and ordered his aids and troups to obey all orders of Vishnumaya. Goddess Parvathy presented to Vishnumaya with two short sticks (Kuruvadies) as his most powerful weapon to fight against injustice and to, protect the devotees in their problems. The main deity in the Perumarath Chathan Seva Madom is Vishnumaya, who is the son of Lord Siva and Parvathi, sent to earth to redress the grievances of the devotees.